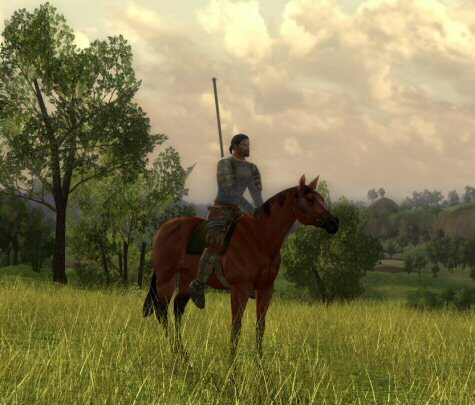 As Keen and Cameron noted, in a somewhat misguided (or at least slightly inequitable or maybe incongruous) demonstration of the Christmas spirit, Turbine is giving out horses to folks in LotRO who signed up as founders (and either bought lifetime subscriptions or have maintained them). I haven’t been on in a while, but have been maintaining my founder subscription so I thought I’d check it out. Yup. After downloaded and patching (which was amazingly smooth and quick– completely unlike the SoE patcher), I was in game. You get a receipt which has been dropped into your character’s inventory. To receive your horse (or pony, if you’re a wee one), simply take your receipt to the horse guy in Northern Bree Fields. All I had to do was “barter” my receipt for my horse and voila! Note, you do not need to do the riding quest given by the same npc to use this. Apparently, its not as fast as a regular mount, but it sure beats walking. I wish games would implement a more staged travel paradigm. It just seems stupid (i.e., fundamentally non-immersive) that heroic characters roaming to and fro across the countryside performing feats of derring do while possessing any number of obscenely rare and expensive magical items, etc. could not afford the humblest beast of burden that the meanest of farmers could afford… Draft animals are not rare. Surely a mighty warrior or sagely wizard could convince someone to part with an old plow nag. A Loremaster can command a wild bear to do its bidding (more or less ;)) but it can’t handle the reigns of a horse?! Bah. On yet another side note, it also seems crazy that in a virtual society that is apparently incapable of teaching the mystical and arcane art of horseback riding to its heroic citizens, such a society is still able to develop and extensive, sophisticated and cheap worldwide system of on-demand taxi travel… How many L20 mounts could one of those F-15 Self-Guided Hippogriffs buy? But I digress. Maybe at level 10 you should get a basic slopoke nag and upgrade at 20, 30, 40, etc. as you can afford or desire. We do it for gear, why not mounted travel? Yes, its good to have a goal, but interim goals and shaving some travel time off the dreaded middle levels would go a long way toward player retention. I think our LotRO group was a reasonable case in point. I love the size and feel of the world in LotRO (despite its annoyingly angular/planar features at times). I hate the travel system the cost of which seems completely out of whack. With Bree being the center of the universe, we all typically had our “map home” set to Bree while we were adventuring increasingly far afield (and still not eligible let alone having enough gold for a mount). Travel time, cost and increasingly grindy play basically sucked the fun out. Taking the edge off travel time is a good way to add to immersion and to still allow players to get to the fun more quickly. Amen to that. They need to start looking at transportation in games as they do a peice of the character’s equipment. Back in the old days of MMOs, perhaps the game worlds weren’t so big and you could consider a steed for travel a luxury. But with game worlds increasing in size, its just as neccessary as a sword or armor. Not to mention that the increasing popularity of MMOs means more customers who are married and have lives that don’t want to waste their play time travelling. The graphics of this game look real like and i would love to play it once. I am always on the look out for new horse games and have been playing a lot of http://www.horseracegame.com/ where i get full satisfaction in breeding and training virtual horses. previously this month. Skype for Internet also now works with Linux and Chromebook for immediate messaging interaction (no video and voice however, these need a connect-in installment).